Since February 7th, 1991, in a city named Jacarei in São Paulo - Brazil, The Blessed Virgin Mary, Our Lord Jesus Christ, Saint Joseph, Lots of Saints and Angels have been appearing and giving messages to the world. The Blessed Virgin Mary introduces herself as the Queen and Messenger of the Peace and makes to the world the last appeal to the conversion, through a young man named Marcos Tadeu, who in the beginning of the Apparitions was 13 years old. These are the final apparitions of Brazil and Our Lady says that these are her final apparitions on Earth. 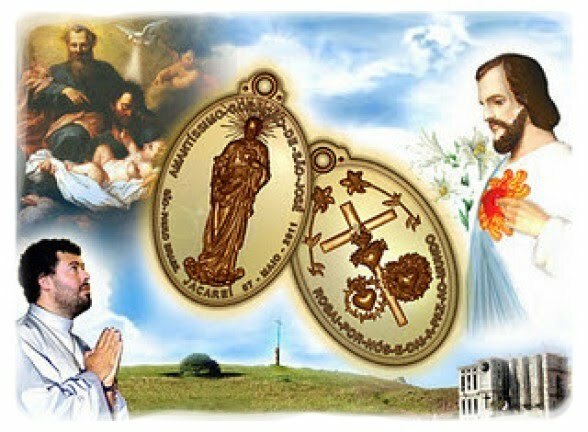 Imposition Prayer of Medal of Saint Joseph and Consecration to the Loving Heart of Saint Joseph, through it, made by the seer Marcos Tadeu on 20/11/2011 at the Apparitions Shrine's of Jacareí. "Oh Loving Heart of St. Joseph, through your Heart Medal, I consecrate myselftoday and always completely at yours Loving Heart.. Throughout your medal, I promise to live as your own son every day of my life, obeying the commandments of God, living as true Catholic son of the Lord, of Most Holy Virgin Mary, yours and do make your Hour of Prayer, every Sunday with love,loyalty and propagate your Heart Medal to all souls as I can throughout my life. Throughout your Medal, oh St. Joseph, oh my Loving Father, I beg you, release me from all evil curses, plagues, accidents, violence, crime, strife and all sorts of ailments of the body that may happen to me. Through your Heart Medal, release me also from all diabolical obsession,possession of all evil and all interference of Satan in my life, my family, my workand in all places where I have to go. Release me also through your Medal of all bad people, false, slanderous, andenvious of my thirsty unhappiness.Release me, mainly through your Medal ofevery sin that can throw me in hell. Leave away from me all about is not the God's will. Everything that offends God and separates me from Him. Throughout your Medal give me the Grace to live in union with God, Mary, with You and the Saints and Angels during all my life.Throughout Your Medal, Oh Most Loving Father, also pour over my home all the blessings of Your Heart so that, we can always live in complete harmony and Peace. Oh Loving Heart of St. Joseph, that wherever I go with the Medal of Your Heart, grant that can also go with the Angels, the Saints of Heaven and Yourself,You may go with me always protecting me and covering me with your mantle. Give me by for your Medal, I always enjoy perfect health of body and soul toserving God, the Blessed Virgin Mary with perfection in this life, can get of You, to praise tTem and also with the Angels and Saints in heaven for all eternity. So be it. Amém"
“Beloved children, my Loving Heart bless you today again, and gives you the Peace. I love you so much, so much! That I would like of to hold you all, inside my Loving Heart, for therein, my sons even drown you, at my infinite love's ocean for you. I love you so much! I love you more than your parents have loved you, or can loves you. I love you with a love, larger than the all parents in the world have together for their sons.. I keep you all at my Loving Heart . My gaze is always placed on you. Trust in My Love! Trust in My Grace, and in My Protection, because I never, never will leave you alone. I am always with you! My gazes pursues you along the day, wherever you go, whatever you do. My gazes follows you, my gazes probe your heart, knows your sorrows, know your anguish, know your troubles, know your fears and ambitions, and my Heart take providence about everything. Provides before God, all necessary graces for you, for that you can live in peace, and forever more walk, and to grow up at the perfect God's Love, at His perfect fullfilment of His commandments and for that you can win with love and faith, all difficults and battles in this life. I am always with you! No tear falls from your eyes no that I see it, without that I become aware, without I know. Then my sons, give me all your cares, all your difficults. Pray very much to my Loving Heart! Contemplate it! Because to contemplate my Loving Heart is the same as to contemplate my Own Love for you. Contemplate it, and you will verify that you do have a shelter, you will verify that you do have a home, and you will verify that you can live at the atrium, of my Loving Heart, and therefore, you can lives in peace. I love you so much! I've offered you so many times My Love, but to many people, have rejected it! I already do not know else, what to do for to show you My Love, and for to make you belive that My Love for you is True, is Big and Pure, is Faithful, and nothing else wishes from you than the perfect correspondence, in other words, to be loved by you all! Come my children! Give me your hearts, and I will completely takes you, and I will place you inside of My Loving Heart, where we'll live together, where we'll stay together, at the same thrill, at the same rhythm of love for the Lord, for to His Love's Law, for to His Word. And then, with our beating hearts, at the same rhythm, we'll glorify the Holy Trinity, with the perfect Love Hymn's. Pray, pray very much! The pray my sons is always your salvation, and the world's salvation. There is nothing most important, there is nothing most precious and powerful, on this earth, than the pray.